If you think that comedians are making fun of themselves for free,then you must be a funny person. Comedians in Nigeria are laughing to the bank on a regular basis. 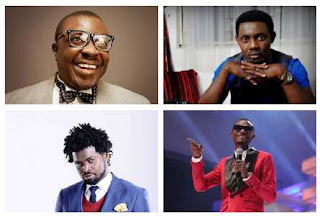 In this post we will take a look at some of the richest comedians in Nigeria in 2019. Ali Baba is one of the pioneers of stand up comedy in Nigeria,he was the first person that commercialized stand up comedy in Nigeria. Ali Baba's has a mansion in Lagos that it worth millions,he also charges over one million naira for a show. Ali Baba is the choice when it comes to performing for politicians,the elite and ex presidents. He is also a motivational speaker an MC and an actor. Ali Baba's net worth is estimated to be about 300 - 500 million naira. He is currently the highest paid comedian in Nigeria. Last year saw AY climb the ladder to become one of the richest comedian in Nigeria through the release of his high grossing movies ("30 Days in Atlanta & A trip to Jamaica")" and also A.Y. live shows held across the country. AY's net worth is estimated to be around 200 - 300 million Naira. AY owns a company and an MVP club. He is rated as one of the richest comedians in Nigeria. AY is reported to charge over 1 million naira per show. Not only is Basketmouth mouth popular in Nigeria,he is also very popular in Africa. He is one of the richest and bankable comedians in Nigeria with endorsement from companies such as Globacom Ltd and Amstel Malta. Bright Okpocha also smiles to the bank after his yearly hosted events "Basketmouth Uncensored" held in London, America and South Africa which are always sold out. Basketmouth is also one of the comedians that has been in the comedy business for over 7 years,he has a booking fee of over 1 million naira per show with an estimated net worth of about N250 - N300 million Naira. Who knew that I Go Dye was a business savvy individual despite the fact that he makes a fool of himself on stage. I Go Dye is the CEO of Revamp Construction Company, a real estate and road Construction Company,the funny man is also an Ambassador to the United Nations Millennium Development Goal. He also has a bottle water company called Franstel Natural Bottle Water,the comedian also has a pleasant relationship with some of the current governor's in Nigeria. He opened a mansion in 2017 much to the admiration of his friends and fans,I Go Dye is also among the league of elite comedians in Nigeria that charge over one million naira for a show,currently he has an estimated net worth of about N290 - N300 million Naira. Okey Bakassi is one of the comedians that has been consistent in the comedy industry in Nigeria. He is also a seasoned actor,Mc,Tv presenter and stand up comedian. The multi talented comedian is also into politics,he is the Senior Special Assistant on entertainment in Imo State,and constantly makes money performing and organizing shows for politicians. He is among the preferred anchors for hosting upscale events in Nigeria. It is said that he has properties in Imo State and in Canada. Okey Bakassi has an estimated net worth of about N200 - N250 Million. Last year was very rosy for Bovi,he definitely made some money from organizing tours adverts, and events. He bought a new Mercedes G wagon car and a house last year,which shows that he is definitely climbing the ranks. Bovi has an estimated net worth of about N150 - N200 Million. Akpororo is one of the comedians in Nigeria that has won the heart of so many comedy fans in Nigeria. Apart from performing in up scale events and comedy shows he also shows a talent for music. Akpororo also performs in christian churches,a feat that most stand up comedians in Nigeria hasn't been able to achieve and he also has his own stand up comedy shows. Akpororo has an estimated net worth of about N100 - N150 Million. Gordons is one of the top richest and bankable comedians in Nigeria.The long time comedian and gospel musician is estimated to be worth N100 - N140 Million Naira,he is rated among the comedians that charge over one million naira per show. Seyi Law was put on by AY,after he won the "Open Mic" competition hosted by AY in 2006,ever since then, he has been going hard. He is one of the top 10 richest comedians in Nigeria,Seyi has an estimated net worth of about N100 - N120 Million Naira. Gbenga is one of the richest comedians in Nigeria. Ghenga is the organizer of the popular comedy shows named Laffmattaz . Gbenga is also a good actor apart from comedy,he also hosts shows for the elite. Gbenga is estimated to have a net worth of about N100 - N110 Million Naira.